Keep gear organized and ready to go with the Fatty Pocket Organizer from Maxpedition. Appropriately named, the carrier features a thicker profile for maximum storage capacity. A clamshell-style opening allows the organizer to lay flat when opened for complete and convenient content access. An ergonomic pocket layout features a total of 15-elastic straps sewn into the interior walls and an additional loop built into the center spine to offer secure item retention. 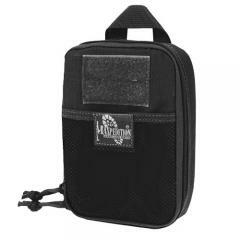 Internal slip and zipper pockets provide additional storage of larger items, such as notebooks, fixed-blade knives and electronic devices. The oversized carry handle allows users to easily retrieve the Fatty from a backpack, or carry it from one location to another. Constructed from military-grade nylon with reinforced stitching, this organizer is guaranteed to outlast the competition.